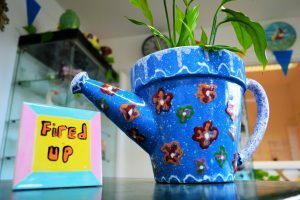 When you’ve been to an event or ceramics class at Fired Up and have finished decorating your beautiful piece of pottery, we then start the finishing process. Once your items are painted they are left to dry for at least 24 hours. The next stage in the final process is the glazing, which involves dipping every item carefully by hand in a tub of green tinted liquid which coats the items, turning them green and chalky. The glazed items are left to dry for a few hours and then each item is inspected carefully and hand-smoothed to remove any drips and bubbles. Our electric kilns are then loaded, piece by piece, layer by layer, using an assortment of shelves, pillars, poles, and stilts. 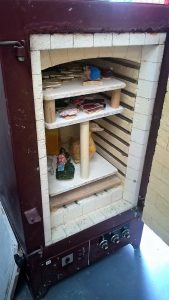 Once full, the kiln is locked and programmed to our earthenware setting which heats up in ramped intervals to a temperature of 1000+ degrees over 8 hours, and then cools down gradually to avoid breakages. It takes another 8 hours before the kiln is cool enough to open and the items can be unloaded. The fired pieces are now glossy and the paint colours are bold and bright. It’s always a delight to see the finished products and our customers’ faces light up when they see how their pieces have been transformed. Each item is then individually bubble-wrapped and bagged ready to be taken safely home and proudly displayed.